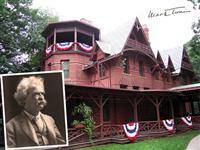 Mark Twain, one of America's most celebrated writers, lived in a stately house on Farmington Avenue between 1874 and 1891. This elegant, 19-room mansion, built in a Victorian Gothic style, was where Twain wrote many of his most famous and successful works (including The Adventures of Huckleberry Finn), and has since been declared a National Historic Landmark. Visitors to the Mark Twain Museum Centre can anticipate a fascinating Ken Burns documentary detailing Twain's life and work, and state-of-the-art exhibition facilities. William Faulkner once called Mark Twain 'the father of American literature', and anyone with even a passing interest in American culture, would be ill-advised to pass up a visit to this significant, and memorable museum.